Sochi: Was It Worth It? There are plenty of new apps that you can get for your iPhone, iPod, or iPad. One of those games is Subway Surfers. This game is the type of game that is addicting and hard to stop playing. There are multiple characters in the game and one thing they can all do is surf. However, they aren’t on water. In this game the characters aren’t surfing on water because they can use hover boards. The character that you start out with in Subway Surfers is Jake. Jake is a graffiti artist and is very talented. In the game, Jake is working on an art piece. He is putting the art on a train. While working, a train conductor and his Pitbull catch Jake. Jake starts running with the conductor and his Pitbull chasing him. While running, Jake has to avoid obstacles like boards and signs. Some of the trains are still while others are moving. Some still trains have ramps to get on them. Jake can use these ramps. You are Jake at the time that he starts running. Jake will start out running slowly and get faster as the game goes on. As you are running on the train tracks, you will see coins. You want to collect these coins for a better high score. There are three train tracks. As obstacles come close, you can slide from one track to another in order to avoid getting hit and thus getting caught by the conductor. This game has many power ups. These power ups include jetpack, 2x multiplayer, super sneakers, and coin magnet. The jetpack allows you to fly over the tracks and collect tons of coins. 2x multiplayer doubles the points you earn during the period of time that it is in effect. Super sneakers enable you to jump higher (over trains) for a short amount of time. Finally, the coin magnet is (obviously) a magnet that collects all of the coins on the track while it is in effect. All power ups are in effect for a limited amount of time. There are five characters in this game. There is Hood (Jake) who is a young kid in a hoodie. Hood wears a red hat under the hood. He is the default player in this game. There is Tricky who is a blond haired girl. Tricky has a ponytail, a red hat, and oversized glasses. Tricky must be unlocked by collecting three of her red hats. You collect the red hats by obtaining a mystery box. Next, there is Fresh. Fresh is a lover of hip-hop, and shows this in the game with his giant boom box. Fresh has tall black hair and wears a jersey. You can unlock him by collecting 50 of his stereos. Then we have Spike. Spike is a rock star, which wears a leather jacket and has a red mohawk. Getting Spike means collecting 200 of his red guitars. Finally, there is Yutani. Yutani is supposedly the “weird” one of the characters. The reason why is because he/she wears a monster suit. The reason I say he/she is because you only see Yutani’s face and nobody knows weather it is a boy or a girl. You get Yutani by collecting 500 of his/her aliens. As you are running, you will come across a mystery box every once in a while. You always want to collect mystery boxes because inside will always be something good. You find out what is in the mystery box after a run. Here are some of the things you can get in the mystery box. You can get coins, hover boards, Tricky’s hats, Fresh’s stereos, Spike’s guitars, and Yutani’s spaceships. In the game, you can use a hover board. You have a limited amount of hover boards but can get more. Hover boards, like power ups, are in effect for a limited amount of time. Hover boards make you invincible for the time they are in effect. For example, if you run in to a train, the conductor won’t catch you. Everything just flashes by and you keep running. However, if a train does hit you, the hover board will be gone and you will just be running again. This game is a fun and addicting game. I highly recommend that you play because I guarantee that it is a cool game. Next time you’re looking in the App Store on your iPhone, iPod, or iPad, take a look at Subway Surfers. This is the question that 8th graders asked frequently throughout the first month of the school year. What does it mean? Well, since it is election year 2012, the 8th graders are having a mock election. The first part of an election is to get money for your campaign. To represent that, 6th and 7th graders received fake money, which the 8th grade campaigns would try to get from you. The first attempts at getting campaign money did not go so well. I heard some things as crazy as “I will give you a hug.” I heard that specific one a couple of times. Halfway through the first month of school, everybody had given away their campaign money. However, since there were really crazy offers for campaign money, we had to start over. For the second time, 6th and 7th graders received campaign money and were instructed again to give them out to the campaigns. I was very excited to find out what new approaches the campaigns would take. The new approaches were actually very smart. The 8th grade campaigns started having bake sales at lunch but instead of asking for real money, they would ask you for campaign money. There were some pretty good deals in some of the bake sales. 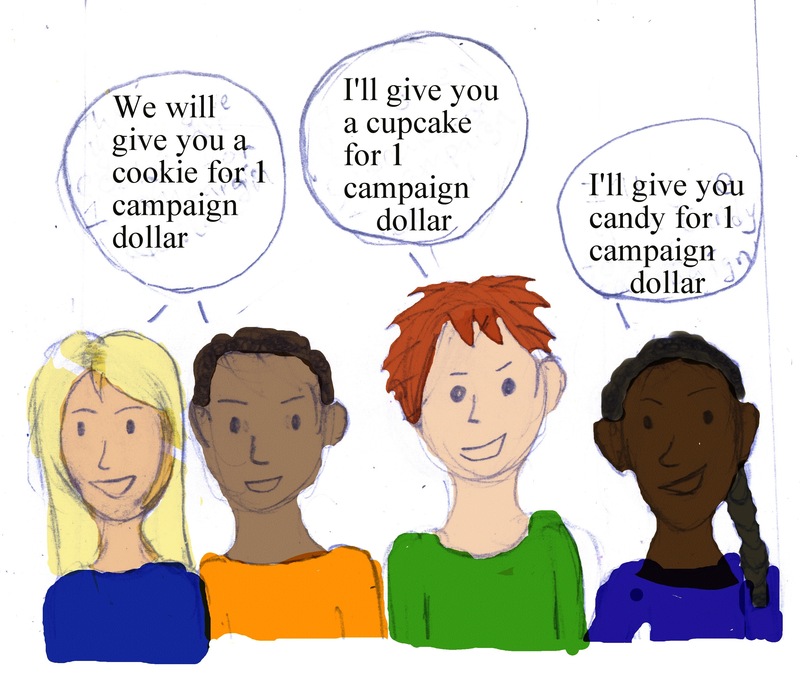 “2 cookies for one campaign dollar.” What did the 6th and 7th graders think of this? They loved this idea of food for campaign dollars. And thus the chaos began again. Every time there was a bake sale, you would see huge lines at the tables. I couldn’t count how many people lined up for food and beverages. 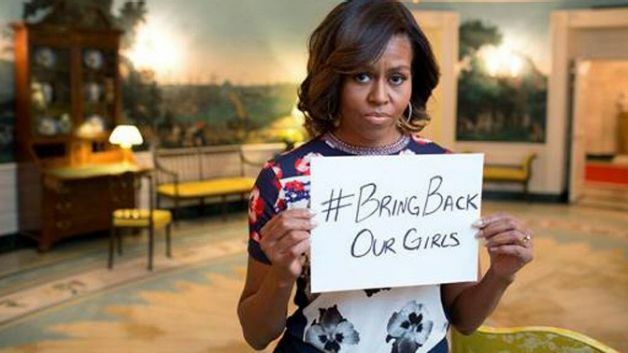 To this point the campaigns were only worried about the campaign money. However, they forgot about the most important thing. The 6th and 7th graders have to vote for a campaign. Thus, began the bigger crowds and the crazier lunchroom. Why did this start happening? It is because campaigns started selling food and beverages for free and were asking that the people vote. Now think for a second. You hand out food and beverages for free, and only want the people to vote instead of just tellingthem to vote. Personally, if I could get food and beverages for free, I would get it and probably not vote for that campaign. I would just thank them for the freefood and beverages. The moral of this story is, be careful with who you vote for. This is the moral because some campaigns just tried to bribe you but won’t actually do anything for the school. Imagine the year is 1975, and movie effects looked terrible and unrealistic. Then one day, someone comes up with this wacky idea to make the impossible. That is exactly what happened with George Lucas and Star Wars. George Lucas wrote the script for Star Wars and showed it to his friends. Everybody he showed it to responded by saying it couldn’t be done. That is when George Lucas came to John Dykstra. John Dykstra was working on the movie Close Encounters of a Third Kind at the time. John formed together a team of young artists and college students studying technology. They immediately got to work on Star Wars. Some of the scenes involved special effects where they painted on a glass board and screened in a different picture. Star Wars came out in 1977 and was the biggest cinematic picture in movie making history. One of its nicknames was The Special Effects Miracle. With the money from Star Wars, George Lucas relocated to a place his company built called Skywalker Ranch. 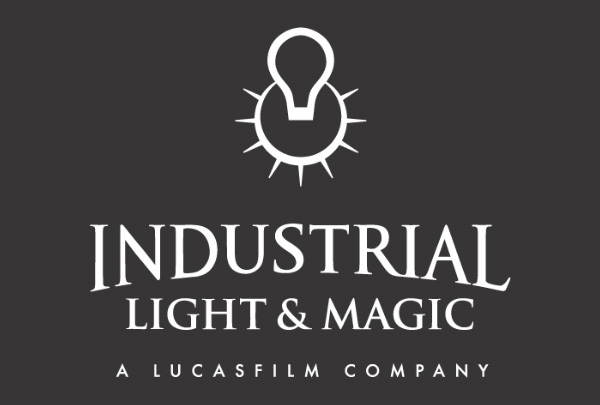 After Star Wars, ILM opened its doors to the outside world. Steven Spielberg’s Raiders of the Lost Ark was done by ILM. Most of the effects didn’t come till the end when they had to melt, implode, and explode heads. When Raiders of the Lost Ark came out, it was an instant hit. As time went on, ILM made more and more movies. As technology advanced, ILM created the idea of Computer Graphics (CG). CG brought special effects into a new universe. With the creation of CG, ILM had the ability to make another instant hit. A movie that brought the audience into a world of dinosaurs. A world of Jurassic Park. Creating the effects done in Jurassic Park was almost impossible. They had to create skeletons for the first test. Then they had to create layers of skin and color. They also had to create a background with the dinosaurs running around and eating each other. After Jurassic Park, ILM was able to do anything. However, as time progressed into the world of computers, the original modeling world was getting upset. People still preferred old models made from hand and refused to move into the modern world of computers. Over time, people started to move into the world of computers and CG progressed. More famous movies were made, such as The Abyss, Harry Potter, and more. After CG was good enough, George Lucas came back to ILM as an employee, wanting to make three prequels for Star Wars. It was extremely hard, considering what he suggested. However, ILM had proved what they could do with special effects in 20 years, and could definitely do this. When Star Wars: The Phantom Menace came out, it was amazing. Everybody was so excited to see the second one. Star Wars: Attack of the Clones and Star Wars: Revenge of the Sith were big accomplishments in the special effects world. ILM has done exactly what in 1975, people thought was impossible. All of their movies have looked amazing to the world. They are not done making special effects yet. The Annual Festival of Lights this past December was a great success. All of the acts were incredible and interesting. Janet Kalkstein was running this assembly. Of course, Janet got help setting up the assembly. I’d like to begin this article by thanking the people who took the time to set up this amazing festival. 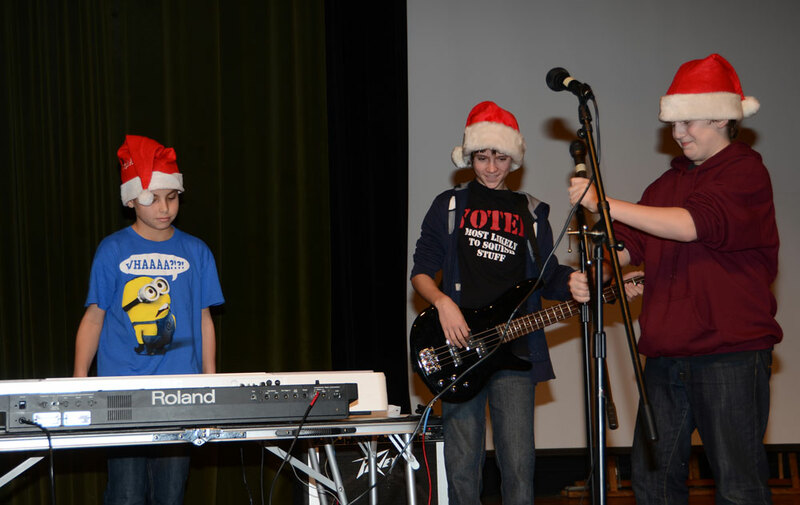 Two Sixth graders started off the festival with a Christmas song. After that, the middle school a cappella sang “One Love, One Heart”. They did a good job with that, and the whole middle school clapped along after a while. The Jewish Affinity group then did a Hanukah presentation where they lit the candles. Jewish Affinity Group was followed up by a school sing along. After that there were two ballet performances which were very impressive. A school band named FUZZ finished off the assembly by singing Stereo Hearts by Gym Class Heroes and Feliz Navidad. Everybody left after a moment of silence and the 2011 Festival Of Lights Assembly had ended. All of the performances were amazing and I bet it got everybody looking forward to a good holiday season. 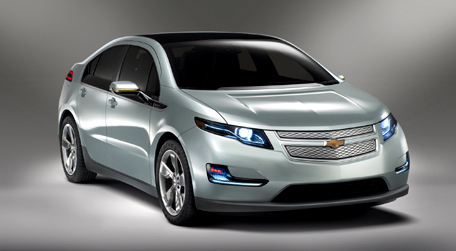 Chevy has come out with a brand new hybrid vehicle . They have called this car the Chevy Volt. “It is very eco friendly and it is very stylish,” Alex Mirage, a sixth grader said. It is eco friendly because of how little gas it needs. Simon Rabinowitz, another sixth grader says he would have this car and he wants it in blue. The car comes in many colors. Ishmael Bynum, another sixth grader asked what I thought of the car and all I can say is that is a big improvement for Chevy. The Volt has Goodyear 17 – inch wheels. You can get a navigation system adjusted in your dashboard. In a review, John Voelcker said that it doesn’t make any shift sounds. He also said that it “drives like a normal car” and its acceleration from stop is continuous.